Rounded shrub with prostrate to erect stems up to 1 m. Bark brown, fibrous. Leaves stiff, needle-like, 5–20 mm long, whitish on lower surface, in whorls of 3, jointed where they meet the stem. Seed cones maturing in 2 years, bluish-black, 4–7 mm long, seeds 2 to 3 (Lesica 2012. Manual of Montana Vascular Plants. BRIT Press. Fort Worth, TX). Across much of MT apart from northeast; Eurasia, AK to Greenland south to CA, AZ, NM, IL, and SC (Lesica 2012. Manual of Montana Vascular Plants. BRIT Press. Fort Worth, TX). Drier forests, forest margins, open slopes, outcrops and rock slides at all but the highest elevations (Lesica 2012. Manual of Montana Vascular Plants. BRIT Press. Fort Worth, TX). Great Plains Flora Association (McGregor, R.L., coordinator, and T.M. Barkley, R.E. Brooks, and E.K. Schofield - eds.). 1986. Flora of the Great Plains. Lawrence, KS: Univ. Press Kansas. 1392 pp. Tirmenstein, D. 1999a. 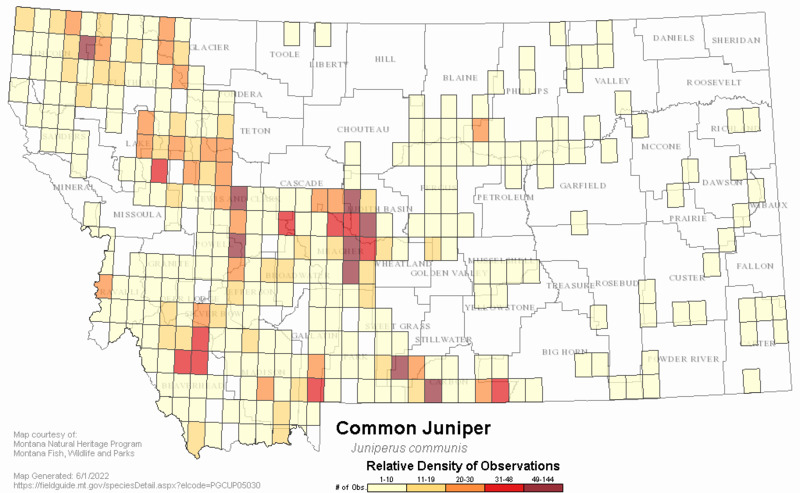 Juniperus communis. In: Fire Effects Information System, [Online}. U. S. Department of Agriculture, Forest Service, Rocky Mountain Research Station, Fire Sciences Laboratory (Producer). 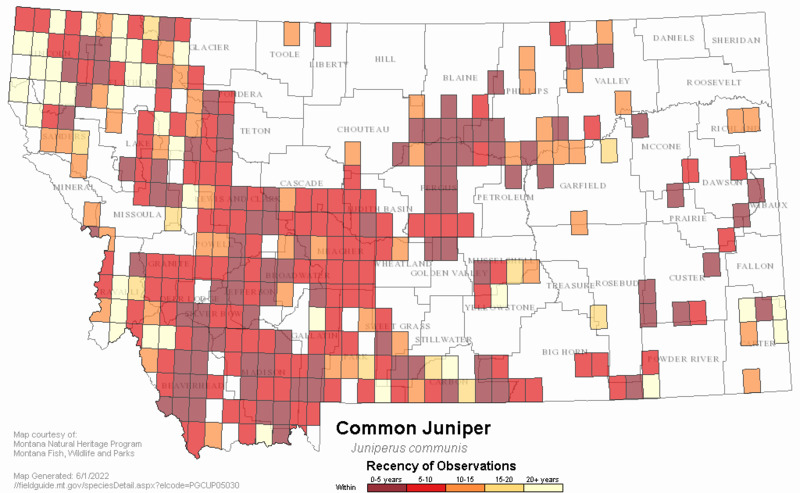 Web Search Engines for Articles on "Common Juniper"